Can you confirm these amateur observations of Sternotherus minor? Type locality: "neighborhood of Mobile," Alabama, "Columbus, Georgia," and "New Orleans," Louisiana, USA. ; restricted to "Columbus, Georgia," by Schmidt (1953:88). intermedius: S Alabama, NW Florida; Type locality: Blackwater River ca. 1 mi NW of Milton airfield (now Peter Prince Field), Santa Rosa Co. FL. This series was collected by H. Harima, J.D. Williams and Dr. J. L. Wolfe. Types Syntypes: MCZ 1570, 1571 (two specimens), 1572 (two specimens), and 1573. Tinkle (1958) subsequently identified MCZ 1572 (the two specimens catalogued under this number became USNM 71111 and UMMZ 63520) and MCZ 1573 as Sternotherus odoratus (after KING & BURKE 1989). Diagnosis Diagnosis (minor): see Stejneger (1923), Smith and Glass (1947), and Tinkle and Webb (1955). Scott et al. 2017 added “corresponding to the S. minor lineage (Figs. 2.4 & 2.7)” to the species diagnosis. Morphologically, S. minor can be diagnosed from all other species of Sternotherus by this combination of characteristics: a round low carapace with flared margins that may possess three keels (a vertebral and paired lateral keels) which are obvious in all but the oldest adults, a distinctly darkly spotted head on a light background, a single gular scute, and a single pair of neck barbels. Distributionally, S. minor occurs in the South Eastern United States from the St. John’s and Withlacootchee River basins in the Florida peninsula, northward to the Ogeechee River drainage in Georgia and westward to the greater Apalachicola-Choctawhatchee-Flint River basins. in Georgia, Florida, and Alabama. Diagnosis (intermedius): Corresponds to the S. intermedius lineage (Figs. 2.4 & 2.7). This clade is geographically cohesive containing the greater Choctawhatchee and Escambia River drainages in southern Alabama and the Florida panhandle. 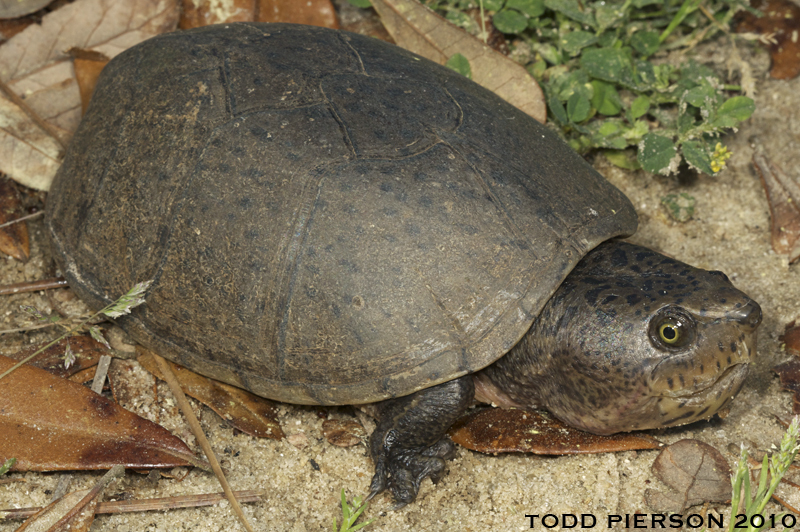 Morphologically, S. intermedius has a dark spotted head on a light background with some degree of striping on the lateral faces of the neck; a single or paired gular scutes are present; a vertebral keel is present with lateral keels reduced or possibly lacking in some populations. Diagnosis (peltifer): see Smith and Glass (1947) and Tinkle and Webb (1955). 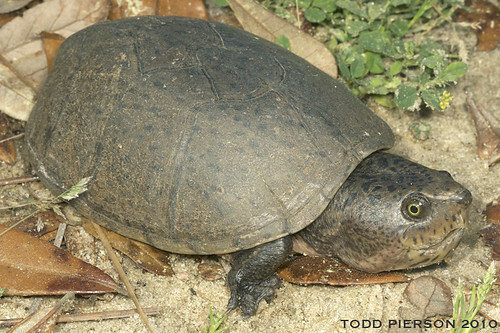 Morphologically, S. peltifer can be diagnosed from all other species of Sternotherus by this combination of characteristics: a round low carapace with flared margins that may possess a single low keel in young animals (but lateral keels are lacking), distinct stripes on the side of the head and neck with a reticulate pattern of lines on the dorsum of the head (not spots), small paired gular scutes, and a single pair of neck barbels. 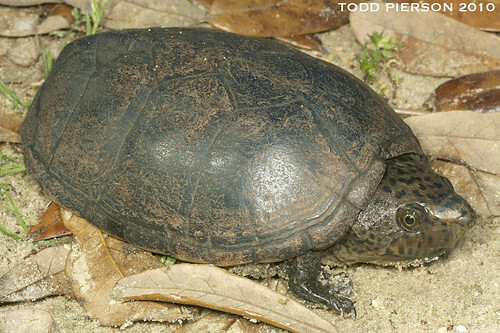 Distributionally, S. peltifer occurs in the greater Mobile River Basin of Alabama, Mississippi, Tennessee, and Georgia, Upper Tennessee River drainages of Tennessee, Mississippi, Alabama, Virginia and North Carolina, Pearl River drainage of Louisiana and Mississippi and Pascagoula River drainages of Mississippi and Alabama. 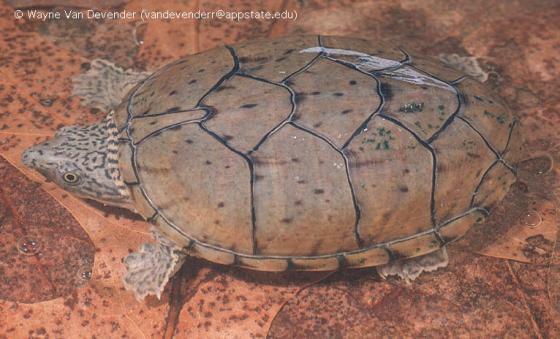 We note that we only included a single individual of S. peltifer from the Tennessee River drainage; thus, further work is needed to determine if individuals from this region should be attributed to S. peltifer, given the hypothesized isolation between animals in the Tennessee and greater Mobile River systems (Stejneger 1923). See S. depressus for a note about hybridization (Scott et al. 2017). Etymology S. intermedius has been named after medieval Latin intermediātus, past participle of intermediāre. This species is named for its long recognition as being a hypothetical “intermediate” form between S. peltifer and S. minor (e.g. 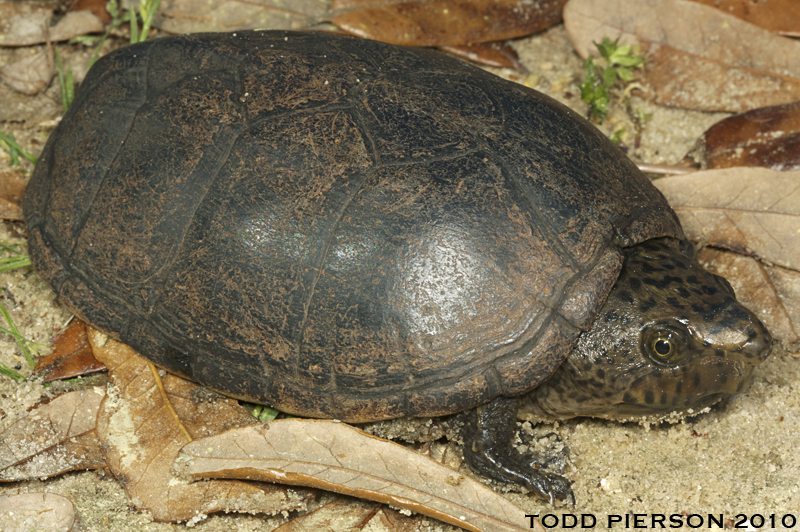 Ernst et al., 1988), as turtles now attributed to S. intermedius have historically been recognized as hybrids between the two aforementioned species due to having a superficially intermediate morphology.